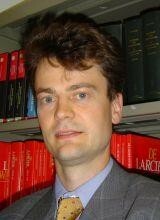 After studies in law and in economics at the University of Ghent, Christoph Van der Elst became a research fellow at the Financial Law Institute of the University of Ghent in 1995. His research focuses primarily on different issues of corporate governance and company law, in particular the influence of shareholders on stock exchange listed companies. He wrote a doctoral thesis on shareholder structures and the determinants of ownership concentration of shareholders on stock exchange listed companies - a legal and economic analysis. Since October 2001 he is professor of commercial law and corporate governance at the Law School of the Ghent University. Since 1999 he is also a lecturer of the LLM/M.Sc. "Law and Economics" programme, at the Law Faculty of the University of Utrecht (Netherlands). In January 2001 he started as a scientific advisor of the Belgian "High Council for the Economic Professions", an advisory council for (chartered) accountants and fiscal professions regulated by Law of April 22, 1999.